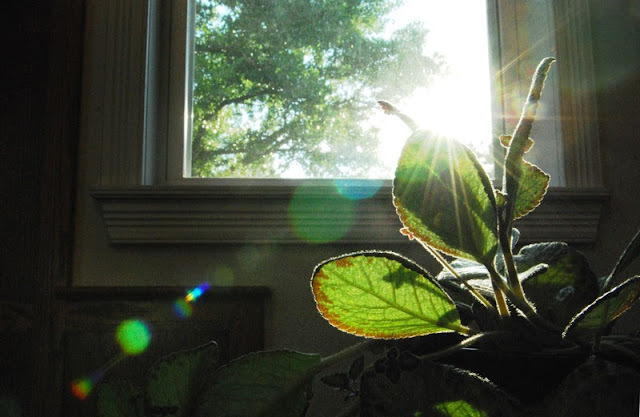 Most mornings the sun shines in so sweetly on this plant. I decided to catch the sun flares in a photo the other day. The plant is episcia and I've had it since about May. It's doing so well! I bought it at the same plant sale that I mentioned here. I've found out it's is related to African Violets. I'll post more pictures of it soon, it's really a neat plant. I textured the photo with one layer of Kim Klassen's "vintage teal" on overlay blending mode. It really brought out the pretty sun flares. Warm and inviting image with great sun flares! oh that light! gosh gorgeous flare. beautifully processed. I love flares! Beautiful shot.